Michael Lombard, MBA, PMP is an accomplished leader in Lean Healthcare, currently serving as the Senior Director of Operational Excellence at Cornerstone Healthcare Group in Dallas, TX. He has been an awesome KaiNexus customer at two different organizations over the last couple of years. 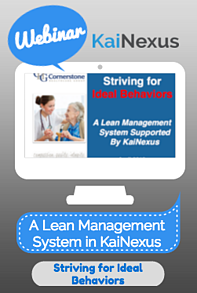 Michael recently hosted a webinar, along with our VP of Improvement and Innovation Services, Mark Graban, about his experiences with hosting a Lean management system in KaiNexus. Cornerstone had the ingenious idea to focus their whole lean culture around ideal behaviors. They found that if you can promote the ideal behaviors for staff and leaders, you are able to uphold the business principles that you think will produce the long term, sustainable results for your organization. If you base your improvement culture around Lean tools, and you always stick with tools, your results will be unsustainable. Cornerstone believes that by focusing on ideal behaviors and developing good improvement and leadership habits, you will better achieve a Lean culture with a lasting impact. For many organization, though, it is confusing to switch from tool-focused to behavior-focused Lean because it’s hard to know which behaviors you should be developing. In this webinar, Michael talks about how Cornerstone bases their ideal behaviors on those outlined in the Shingo Model. There’s a human reflex for recognizing patterns, even when there’s not really a pattern there; you’ve seen this with optical illusions. But you can’t jump to conclusions when you’re doing improvement work - you need to be methodical and work to understand a situation, why it’s happening, and what you can do to improve the process. It’s pretty easy to come up with a list of behaviors that will help your organization achieve its goals. It’s even pretty easy to write up a schedule for which each of those behaviors will be done - the CEO will go to Gemba every Wednesday, each team will huddle every Monday morning. You might even develop a habit, and that’s great! But what’s keeping those behaviors from just becoming a perfunctory “We did it, now we’re done” measure? It’s vital that each of them is treated with the same enthusiasm and interest each time they’re done and that they don’t just become another item on a checklist you need to breeze through. KaiNexus gives Cornerstone a platform of tools to help them align daily improvement with strategic initiatives, improve all processes every day, and enable everyone to participate. Using KaiNexus encouraged Cornerstone to define their True North priorities by making them confront their enormous list of goals and narrow them down to a manageable number. Now, everyone who submits a project at Cornerstone is encouraged to align it with a True North measure. About 75% of Cornerstone's current improvement projects align with True North priorities. Typically each Board has four lanes, and each lane has three card - two run charts and one project list. The leftmost cards display a metric that ties in with a True North metric. Leaders then use the second cards to see if, through the Catchball method, they can identify a metric that drives the corresponding True North metric. Using this method, leaders complete a few Catchball cycles to find out what their first metric is going to be, then do a few more and find out what their second metric should be, and then do a few more and determine what projects they could do that would impact those metrics. The simple act of creating their Huddle Boards in KaiNexus promoted the Catchball behavior. You can build an Improvement/Project template that matches your desired workflow. This enables your staff to engage in correct improvement behaviors and your leaders to practice coaching. Learn more about improvements and projects in KaiNexus here. KaiNexus’ charts give everyone a clear understanding of data so that you can promote established target conditions and data trending. These charts can be updated from any screen and displayed on any board and alongside any improvement or project. Learn more about charts and data here. By creating teams to work on projects and improvements in KaiNexus, you’re able to establish a formal coaching chain. Learn more about teams in KaiNexus here. With KaiNexus’ list function, you get access to a lot of information - the title, status, start date, and end date - and that gives you just-in-time reporting and the click of a button. That makes it unnecessary for people in the field to do manual reports, duplicate reports, or to hold meetings to review or clarify those reports. By building in quality information at the source, rather than trying to report it in on the back end, hospitals leaders have more time free for their work while corporate leaders have the information they need. Learn more here. For more information, watch the webinar now!